Oh boy, do I have an amazing recipe for you today. I think the name and picture alone should be able to convince you, I hope. Lemon. Berry. 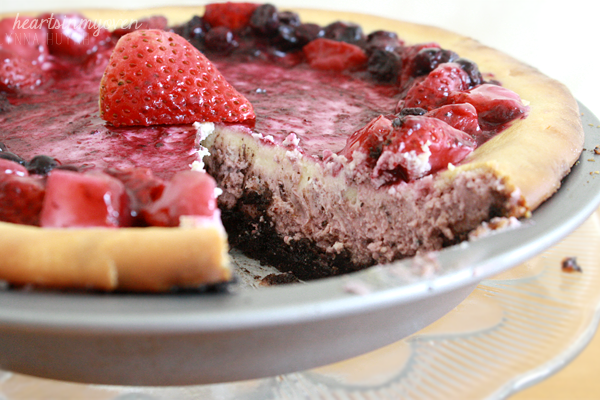 Cheesecake pie. It sounds, looks, and best of all, taste amazing. I`m not a gigantic fan of cheesecake. Or, so I thought. I do love a GOOD cheesecake slice. Unfortunately for everyone, cheesecake is heavy and unhealthy to eat. One day, I was was craving lemon cheesecake. It was a terrible craving to be having. Why? Because the only solution was to eat one. Since I didn`t want a huge cheesecake laying around, I decided I wanted to make a cheesecake pie since it`s thinner and slightly smaller than baking a thick cheesecake in my 9 inch square springform pan. A slice of this should satisfy my craving for the day. Right? Well, yes. Sort of. This cheesecake definitely satisfied my craving, but it was so delicious, I kept craving more. And, MORE. I ate a slice, every single day for a WEEK. Yes, I had to work out like crazy afterwards. Do you see the pictures? The crust is an Oreo cookie crust. My favorite crust in the world. On top of that crust, is a lemon berry cheesecake layer. Then, a lemon cheesecake layer. To top it all off, a thin layer of berry sauce and more berries. Did I make you drool, yet? Since I`m not a cheesecake lover, this cheesecake is a HUGE thing for me. I LOVE this cheesecake. Love, might even be an understatement! I shared it with some friends and they absolutely loved it. I gave a slice to one of my friends on campus and he ate it while walking home, with his HANDS, because he couldn`t wait until he got home. Another friend said she thought I bought it from the store because it was so pretty and good. Others, texted and messaged me to compliment the cheesecake. What makes this cheesecake even better is that you don`t need a water bath or anything. Just bake it! It`s more time consuming than baking cookies or muffins. But, how often do you reward yourself with a delicious cheesecake pie? 1. Preheat oven to 350°F. Line and grease bottom and sides of pie pan. 2. In a small-medium bowl, mix Oreo crumbs with melted butter until crumbs are coated with butter. 3. Press crumbs onto pie pan and bake for 5 minutes. Remove and set aside to cool. 5. In a large bowl with electric mixer, beat together cream cheese and sugar until light and fluffy (about 3 minutes on low-medium speed). 6. Add salt, flour, and vanilla extract and beat until incorporated. 7. Add the eggs, beating after each addition. 8. When mixture is smooth, add in the heavy cream and beat slowly at first. 9. Add 1/2 of the lemon zest and lemon juice. When cream is more incorporated, increase the speed to medium. Beat until creamy. 10. Divide batter into two bowls. 11. In a food processor, puree berries with the other half of zest and juice of the lemons. 12. Add half of the berry mixture to one of the bowls and mix until combined. 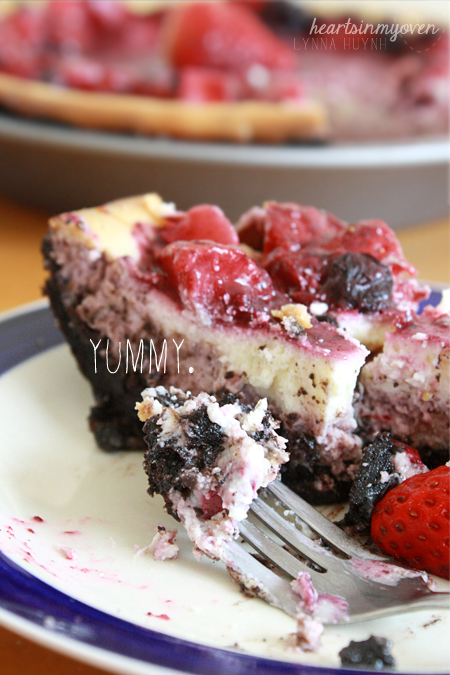 This will be your berry cheesecake filling. Refrigerate the rest of the berry mixture. 13. 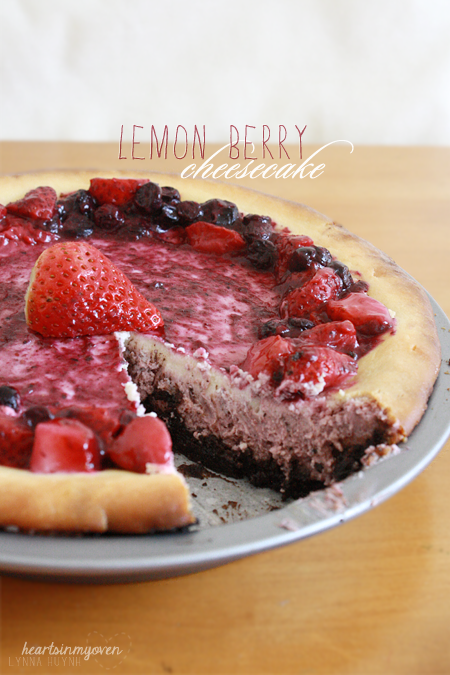 Pour the berry cheesecake filling over crust and bake for 10 minutes. 14. Remove from oven and add the other cheesecake filling on top. 15. Bake for about 50-60 minutes, or until the topping is set. 16. Allow cheesecake some time to cool before chill completely overnight. 17. To make the berry sauce, in a small saucepan, heat up the rest of the berry mixture with the cornstarch. Add in more fresh berries, if desired. Stir it around with a wooden spoon until mixture thickens. Remove from heat. Chill until cheesecake is completely chilled. 18. When cheesecake is fully chilled, spread the berry sauce on top of the cheesecake. Garnish with extra berries. - Refrigerate leftovers with plastic wrap covering the top.